For all of you who love a great burger you need to check this out. 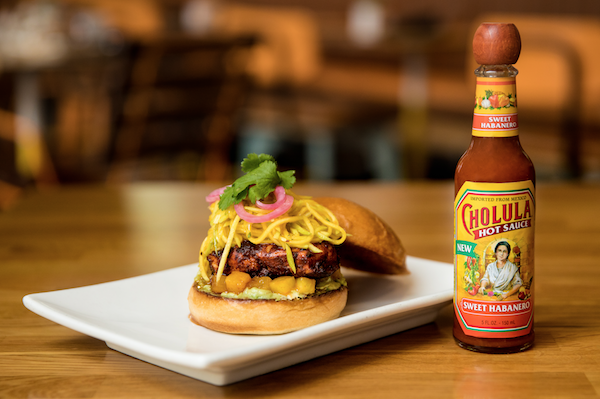 Cholua has partnered with Umami Burger to create the ‘Sweet Habanero’ Chick-Me-Out Burger, Umami’s first-ever grilled chicken sandwich featuring Cholula’s new flavor, Sweet Habanero. And, it’s for the health-conscious served with a vegan bun or in a lettuce wrap! The secret menu item will be available only at the Umami Burger at the Grove in LA now and two other select locations in Chicago and NY until June 6th. The sandwich features an array of colorful & flavorful ingredients, including Cholula Sweet Habanero Hot Sauce, Adobo Marinated Grilled Chicken Breast, Smashed Avocado, Pickled Red Onions, Lime & Green Mango Slaw & Charred Pineapple. Who is hungry? Make sure you check out the ‘Sweet Habanero’ Chick-Me-Out Burger before it is gone. Print article This entry was posted by Art Eddy III on May 8, 2018 at 1:45 pm, and is filed under Lifestyle. Follow any responses to this post through RSS 2.0. Both comments and pings are currently closed.